The collaboration between the Giorgio Cini Foundation, Master Audio and Coemar Lighting was organised ahead of the reopening of the Palazzo Cini. The aim was to equip the rooms of the Gallery with suitable lighting systems able to preserve the typical atmosphere of the museum house and to showcase through an unobtrusive but effective light the precious works in the Vittorio Cini collection, now part of the heritage belonging to the Foundation named after his son Giorgio. The Gallery’s innovative lighting system is the result of collaboration between Maurizio Schicheri, the founder of Master Audio, a company specialised in designing lighting for exhibition spaces, and Carlo Alberto Pini and Patrik Menozzi, lighting engineers with Coemar Lighting, which for over eighty years has designed, produced and marketed professional lighting products. The project relied on the expert collaboration of Marina Vio, a lecturer at the Venice University Institute of Architecture (IUAV), who had previously studied the lighting for the enamels in the Cini Collection. The work at the Palazzo Cini was focused on improving the colour perception of the works and objects on show. For this purpose, the designers made use of the results of a joint study conducted by IUAV and the University of Padua, which subsequently became the basis for the prototype lighting system specially made for the Gallery. The principal new feature in this lighting system is the innovative use of LED sources. The richness of the Cini Collection and the variety of materials in the works on show presented a problem that was difficult to solve: each material reflects light in a different way and the colours can only usually be brought out if the objects are lit singularly with a customised light. 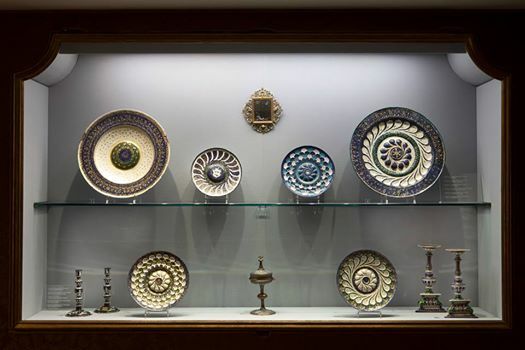 With so many varied types of objects (paintings, painted panels, ivories, and finely decorated enamelled metal plates), however, a single lighting system would have impoverished the value of the works. On the contrary, the lighting fixtures developed for the Palazzo Cini make it possible to separate the light sources through a combination of different types of LED. When combined and regulated individually, they can provide variations of white from warm to cold, which can be modified according to the “needs” of each individual work, allowing visitors to admire the masterpieces in the Palazzo Cini in a light that is as close to natural as possible.